Sutton Council looks to have invested heavily in a poster campaign to tell us all that they are running out of money. This poster appeared at the end of Caldbeck Avenue a few days ago and looks to be one of many around the borough. 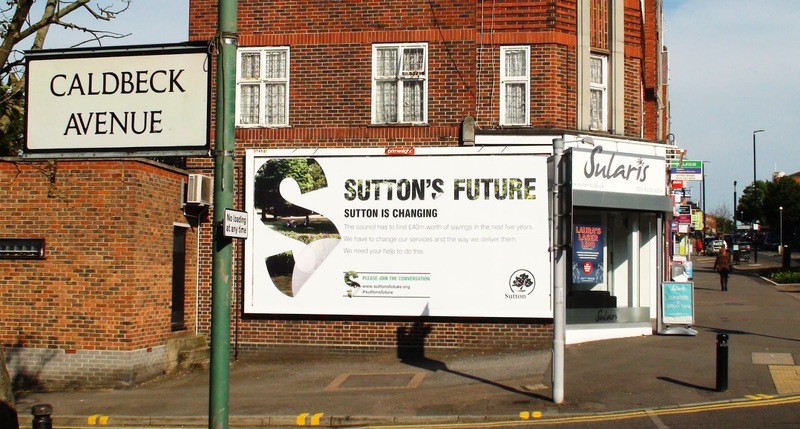 "I was staggered to see this poster appear at the end of Caldbeck Avenue this week asking to 'join the conversation' about how Sutton Council can save money. My suggestion - not wasting thousands of pounds on a poster advertising campaign. Working in advertising I know that a billboard poster such as this might have cost around £500 when you factor in printing etc. If this has been posted across the borough then I dread to think what the overall cost will have been in total." Couldn't have put it better myself. I guess Sutton Council hasn't learned a thing about prudently spending other people's money. I guess it's much easier to get people to accept poorer service if they feel they've contributed to how it's done. Even though I wonder if, given past experience, the decisions have already all been made and any such 'consultation' is entirely for this purpose and will have no actual baring on what happens to Sutton's council services.